Woodshed Art Auctions has announced it will be auctioning an opaque watercolor painting of Apple's classic logo by the late Andy Warhol next month. 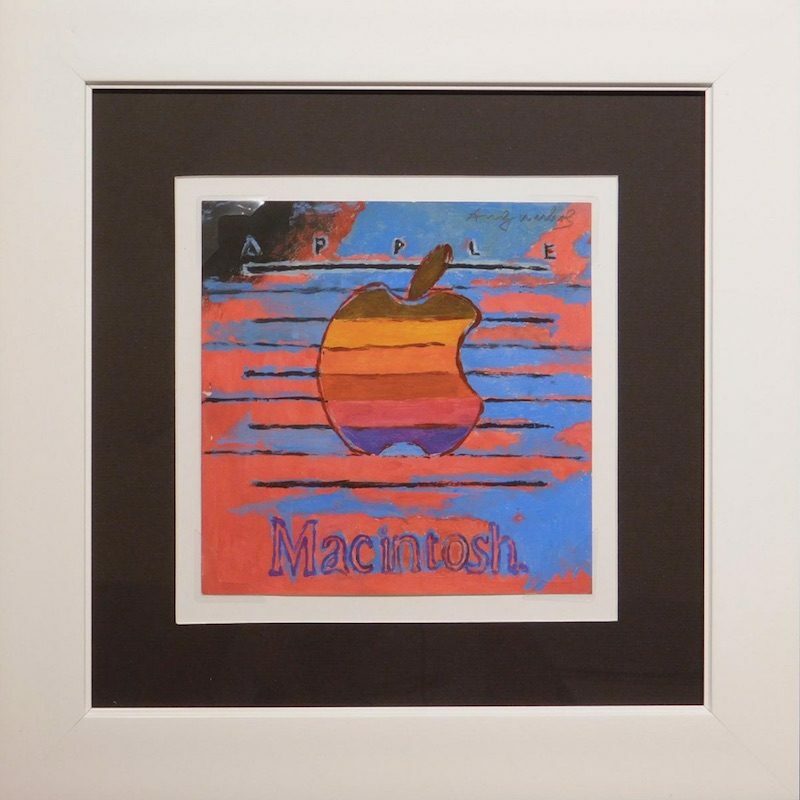 The painting is part of Warhol's "Ads" collection from 1985, one year after the original Macintosh launched. It features Apple's old rainbow logo, which the company used from 1977 to 1998, between Apple and Macintosh word marks. The painting measures eight inches squared inside a 16.5-inch squared frame, and it is signed by Warhol on the front and back. It is said to be in "very good condition" with archival corners and no adhesives touching the artwork. While a similar Macintosh canvas painting by Warhol sold for $900,000 at a recent Sotheby's auction, this gouache painting is on paper, so it is seemingly less valuable. Still, it is estimated to fetch between $20,000 and $30,000. Warhol, who passed away in 1987, was a famous artist known for his paintings of iconic American items like Coca-Cola and Campbell's Soup, and celebrities including Marilyn Monroe, Elvis Presley, and Muhammad Ali. Live bidding opens on the Woodshed Art Auctions website on February 1 at 5:30 p.m. Eastern Time, with a minimum bid of $5,000. I'm in the wrong business. I could do this easily....but as someone said above, you are buying the name of the artist. Which makes absolutely no sense to me. Why do people want things created by weirdos? "l could have made this." I got a nice painting of a cow I bought for $8 the other day. No idea who drew it, but between the painting I have and this one, I vastly prefer the cow painting, and that's before even factoring in price. There's no accounting for some people's (complete lack of) taste. Like, honestly, what the heck does someone buying this think? That they're going to be able to go on to sell it for more later on? That requires there being someone not just as dumb (and wealthy) as you, but even dumber and wealthier. It's going to come to an end eventually - how can the buyer be so certain that they're not the dumbest person, the one at the end of the chain? Or is it possible to have enough money to impulsively spend $30K on a painting? I guess that'd require having a net worth of around... $3B or so*, for $30K to seem like a small enough purchase to just impulsively do it. * Because at that point, you're making enough interest that within a few hours your net worth has increased by $30K. I tell you now, this will go for a lot more than $30,000. Mark my words. Agree with others that this will go for several times the estimate. If you don't see the art in this, you probably also don't appreciate photography as art. Photography? Pfoooh! It's just pushing a button. It's pushing a button at the right time and right place. Where was Apple in the minds of the public when Warhol did this? Was it up there with Campbell's Soup? That's the genius! What logos did he capture that turned out to be nothing today? I'd guess none. I have two "Warhols" on my walls! - I Shot Andy Warhol. Vintage movie poster, British Quad format. Two sets of triple-repeated images of Lili Taylor, who played the woman who shot Andy Warhol in the movie "I Shot Andy Warhol". The image is after Warhol's work Triple Elvis. The former is in my office. The latter is in my living room. From the living room, you can see both. I think it's some nice irony. Is the juxtaposition itself art? I think so. I know. I find that with a lot of art, it's not the art itself, but the painter. If they said that my sister's 6 year old daughter painted this, it might go for a few bucks. Yet, if you put a kindergartener's art project in the Louvre and said that it's a Van Gogh, people would pay thousands of dollars for it. Next time you're standing in front of a Van Gogh. have a good look. That is not "kindergarten" art… and could never be mistaken for it. Now, Tracey Emin stuff on the other hand… "Look Mum, I messed up mah bed!" "Here's to the crazy ones. The misfits. The rebels. The troublemakers…"
Warhol's work IMO is copies of stuff. I mean Com'on, a Campbell's Soup can? Colorized photos of famous people? Apple logos!!? If people like his work, more power to ya...I happen to think he's HIGHLY overrated and mediocre at best. County fair level....hell, some county fair art is better! This is really funny. I think you and others here don't get "art". Anybody can paint in a way but can you create art? Somebody said nowadays with the computers anybody could be an artist. Like technology makes art easier. Well guess what anybody could be an artist back then as well. Cameras existed back then, oil and canvas was cheap and so on. You don't make art because you know how to hold an pencil or because you can afford an expensive camera. Hell Keith Haring started with chalk on blacked out ads at the subway stations. You create art because you want to tell something. You want to express yourself. But hey its ok. I actually feel sorry for people like you who can't see real art. Who think a cow painting has to look like a real cow. And I don't say it in a bad or elitist or mean way, I really feel sorry. Even knowing you don't get why I feel sorry because you don't see what you are missing out. Like I met this guy who lost an eye as a baby and had this glass eye and I said I am sorry that you can't see in 3d and he is like don't be sorry because I don't miss it since I don't know it. Enjoy your cow painting and be happy it was just $8 and don't make fun of other people enjoying real art just because you can't value it. The art business is all about money laundering, international untaxed wealth transfer, and general tax evasion. The art itself is irrelevant, and doesn’t need to be actual art. Hence conceptual contemporary “art”. Interesting theory. I'm sure art world would like to know more. Not a huge fan of Warhol myself, but for those who are, think of it as 150 shares of AAPL. Not a massive sum by any means and certainly in reach of someone worth far less than billions. Art collectors aren't really any more impulsive than anyone else. They know that fine art value doesn't come "to an end," it tends to increase. I am reminded of the fable The Emperor’s New Clothes. What people appreciate as art sometimes baffles me. I realize personal taste is a factor. But I just can’t see anyone paying much for this. There isn’t much in the painting itself. What you are buying is the fact that it was crafted by a particular person. In that sense it is more like autograph or personal relic collecting. That's just the thing with art, you don't have to understand why something is appreciated by someone else but not you. I bet this piece sells for more than the high end of the estimate.